Canada currently accepts more migrants under the Temporary Foreign Workers Program (TFWP) than it does permanent residents. Barriers to permanent residency for refugees, skilled workers and family members are increasing, while citizenship for migrants is becoming harder to get and easier to lose. The Philippines is the major source of temporary cheap labour for Canada along with the United States, United Kingdom, China, India and Mexico. Filipino workers, just like other migrant workers, are recruited from the Global South. Their temporary status makes them vulnerable to employer abuse and excessive exploitation. Poverty, unemployment, the absence of genuine industrialization and agrarian reform and the Philippine government’s Labour Export Policy, continue to push workers out of the country by the thousands everyday to work abroad. “Migrants are human beings first before they are workers. They are not mere statistics to buttress a country’s gross domestic product. Let us not forget that migrant rights are human rights,” said Dr. Chandu Claver in his presentation to the members of the CUPE-BC International Solidarity Committee in October 2014. Claver is an active member of MIGRANTE BC, a provincial chapter of MIGRANTE Canada that focuses on advocacy for Filipino migrants in British Columbia. 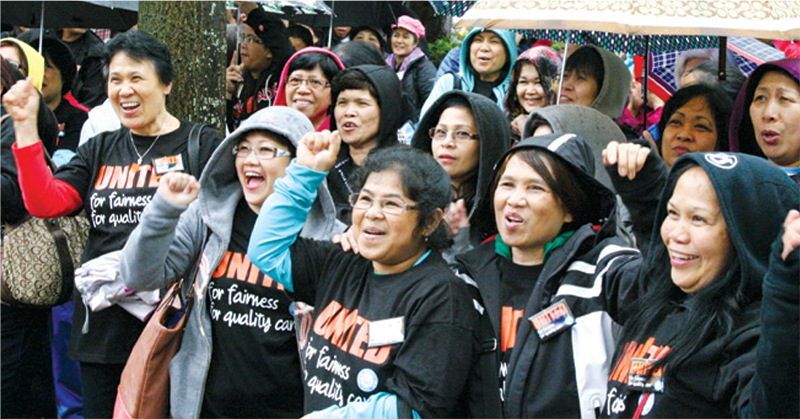 MIGRANTE BC aims to organize, protect and promote the rights and welfare of Filipino immigrant and migrant workers in BC. The invaluable support and community collaboration between CUPE and MIGRANTE BC will contribute to advancing the organizing work, education and political campaigns that promote and protect migrants’ rights and welfare.